The research partners have now completed a body component for the automotive industry made of steel and unidirectional fiber-reinforced thermoplastic tape. Fraunhofer Institute for Production Technology IPT and for Laser Technology ILT says that it is developing ways to combine metal and fiber reinforced plastic composites for automotive and aerospace applications. The institutes and 14 other partners have formed the ComMUnion EU research project which aims to reduce the weight of parts and find a way to cost effectively mass produce them. The new hybrid manufacturing process is reportedly based on a combination of laser texturing and laser-assisted tape placement whereby components are first pre-processed using the laser to provide a defined, rough surface structure. The textured surface allows the continuous fiber-reinforced thermoplastic lightweight materials, which will later be used for stiffening, to be bonded directly to the steel component. The bond is then mechanical, eliminating any need for additional pre-treatment measures or additional adhesion promoters, such as adhesives or bonding agents. The stiffenings made of thermoplastic fiber-reinforced plastics are then joined to the component using a tape placement process, Fraunhofer says. The laser heats the thermoplastic tapes locally in the joining zone to the steel. The matrix material melts and flows into the laser textured cavities. After solidification of the melt material, the tape with the embedded unidirectional fibers adheres to the roughened surface of the steel part. According to the partners, this process is particularly suitable for mass production, as no further post-processing steps, such as curing operations, are required to consolidate the material after tape placement. Additionally, precision localized heating reduces distortion and residual stresses while joining the two materials. 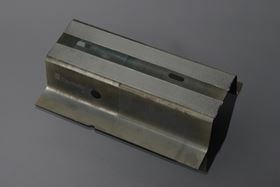 The laser texturing process, which has been developed at the Fraunhofer ILT, can also be applied in a reproducible way to the metal surface, precisely at the locations where the textures are needed. Additionally, the laser is not subject to any tool wear. The research partners have now completed a rocker panel, a body component for the automotive industry made of steel and unidirectional fiber-reinforced thermoplastic tape to test and prove the functionality of the process combination. This story uses material from Fraunhofer, with editorial changes made by Materials Today. The views expressed in this article do not necessarily represent those of Elsevier.